This time last year I was hiking in Yosemite with my daughter, Shamira. 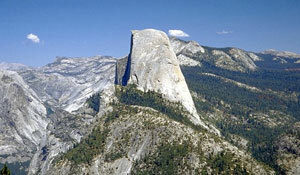 The Half-Dome Mountain - the one Captain James T. Kirk fell from and was saved by Spock – stands majestically among some of the most beautiful of the US scenic treasures, as it has for aeons. 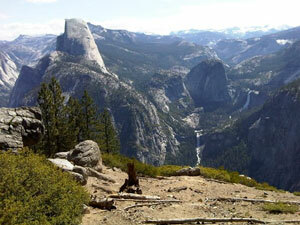 Yet Half-Dome has experienced extreme change. As the youngest of the giant granite structures – just 87 million years old – it was belched from it’s birthplace, miles deep within the earth, to standing almost 9,000 ft. It went from magma temperatures to being encased by freezing glaciers – that’s extreme change. Just a few weeks before our visit, a massive 1.5 million cubic feet fell from it - a change that registered a 2.5 earthquake. Yet it remains majestic as if nothing had happened. Man is puny in comparison to Nature. Currently it is topical for our generation to make a political issue out of climate change, almost as a distraction to addressing more directly pressing dilemmas. Asking a Victorian - 110 years ago - how to connect to the internet, can be likened to asking how to stop Volcanic Ash from grounding a whole continent today. It is just beyond our comprehension. Yet in 110 years – IF climate change becomes the issue (and Nature has not readdressed the balance itself) – then the level of thinking at that time will address the problem. And much more simply than we can today. Tomorrow’s problems have never been addressed with today’s thinking – which is why, for example, every war is fought on the last war’s rules. That is Nature’s role – to address the balance whenever required. It is up to Man to deal with today’s problems today and tomorrow’s problems tomorrow. And the greatest concern today – for almost every human being - is either the extreme poverty, from lack of investment or the mountain of debt caused by our consumptive ‘I want it now’ thinking. Only a change in thinking will address the balance. Greed and Speed must make way for Invest and Best. Only through change do we evolve. Without change we continue to reap the same reward: anxiety and stress. Change is constant, said Disraeli, without it we stagnate. The secret to evolving into our very best is to make massive change in our lives. To embrace the challenging times as the best stimulus for us to make the very best of ourselves. To build a rock solid character that majestically stands irrespective of the challenge faced. To become looked upon with a respect that sets an example for others to follow. For if we want to change the world, we must massively change our self. If that means taking the road less travelled, then it is the right direction.